C-Line ticket holders made of clear vinyl for views of both sides. 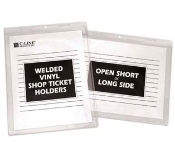 Vinyl holders are the way to protect your job tickets, documents, shop tickets and specially in a environment prone to dirt and dust. Easily wipe clean the vinyl sleeve. C-line products are high quality and are very durable. Metal eyelet at the top for hanging your shop ticket so it's visible to everyone. C-Line 80912 is the most popular size for job tickets 9x12.